First of all, what is the APEC? APEC stands for Asia-Pacific Economic Cooperation. It is a forum consisting of 21 countries, which promotes free trade and economic cooperation in the Asia-Pacific region. APEC was established in 1989. Canada joined APEC in 1989. An APEC meeting is held yearly and attended by the heads of government of each member country. In 1997, this APEC meeting was held in Vancouver at the UBC campus on November 24 and 25. During this summit, a protest was held at a designated protest area at UBC. These demonstrators were protesting against the heads of state that were responsible for human rights violations in their respective country. In particular, Indonesian President Suharto and Chinese President Jiang Zemin were singled out by the protestors as being violators of human rights in Indonesia and China. In fact, Indonesian President Suharto threatened to boycott the Summit if the demonstrations embarrassed or offended his dignity. Some of Suharto’s comments regarding the protest can be found here. Protestors eventually knocked down a security barricade in the designated protest area and RCMP officers responded with pepper spray, police dogs and arrests. Even a CBC camera man was hit with pepper spray. Many allegations of police misconduct were alleged against the RCMP. One such allegation was made by Craig Jones, who was reportedly arrested, held for fourteen hours and released without charge for displaying signs of “Free Speech,” “Democracy,” and “Human Rights”. Due to the many complaints filed against the RCMP, a Commission or Inquiry was held, which investigated the allegations of misconduct by RCMP officers. The Commissioner of Inquiry found that the conduct of individual RCMP officers, in some instances, were inconsistent with the Charter of Rights and Freedoms and that members of the public were affected by RCMP misconduct. The final report of this commission can be found by clicking here. Also, a chronological timeline of events relating to the incident can be found by visiting the this website. After I typed in Vancouver 1997 APEC Summit into the Google search engine, a wide range of websites relating to the topic popped up. The first website that comes up in the search is the Foreign Affairs and International Trade Canada website. The federal government website details the 1997 Vancouver APEC Summit. There is no mention of the protest or abuse of police authority on this website. The second link that came up was a Wikipedia link which described everything about the Asia-Pacific Economic Cooperation. Under the heading of meeting developments, there are couple sentences that deal with the controversy that occurred with the RCMP using pepper spray against protesters in the 1997 Vancouver Summit. Other conflicts and threats to the other summit are also touched upon. The fourth link linked me to the Commission for Public Complaints Against the RCMP website. Here the details of the Commission that resulted from the police misconduct at the protest are found. One link titled Fears of APEC-style Clash in 2010, referred to protests and even had the following picture of the 1997 protests. When reporting on the fears of a conflict at the 2010 APEC Summit, plenty of mention was given to the Vancouver Summit. This website had interviews of some of the protestors and even with the executive director of the BC Civil Liberties Association. No RCMP representative was interviewed and it seemed to me that the article was written in favour of the protestors. Overall, after typing in Vancouver 1997 APEC Summit, all but one link on the first page of the google search engine has some mention about the confrontation between protestors and RCMP officers. This one website without any mention of police deviance is the first link and is a government of Canada website. You mention that the inquiry pointed out misconduct on the part of individual officers. Consider this remark in relation to Maurice Punch’s observation that ‘there are no individuals in organizations’ like the public police. Were the events at APEC ’97 examples of ‘rotten apple’ activity, or do they point to broader – or even systemic – issues? Your observation that the DFAIT website on APEC includes no mention of the controversy surrounding the policing of the event is interesting. What is your interpretation of this omission? In the classroom handout “Public Order Policing”, dated November 3, 2011, it is mentioned that De Lint and Hall note that even though in the 1980s in Canada public order policing was characterized by an increasing emphasis on the liaison approach, this all changed in the 1990s, which now can be described as a ‘season of discontent’. As the protestors of the 1997 APEC Summit in Vancouver were protesting human right violations by the governments of China and Indonesia, it is ironic that their own rights for freedom of speech and assembly, guaranteed by the Canadian Charter of Rights and Freedoms were trampled upon. How the RCMP handled the protestors at the APEC Summit of 1997 in Vancouver is a clear display of the coercive power of the police and their relationship to the status quo and certain political and propertied elites. For when confronted with their excessive use of force against the protestors during the Summit, the RCMP claimed to be following orders, as given to them by the Prime Minister of the day, Jean Chrétien. A good question to consider is that when it comes to dealing with crowds and circumstances of disorder, can public order policing ever be done without raising controversy? 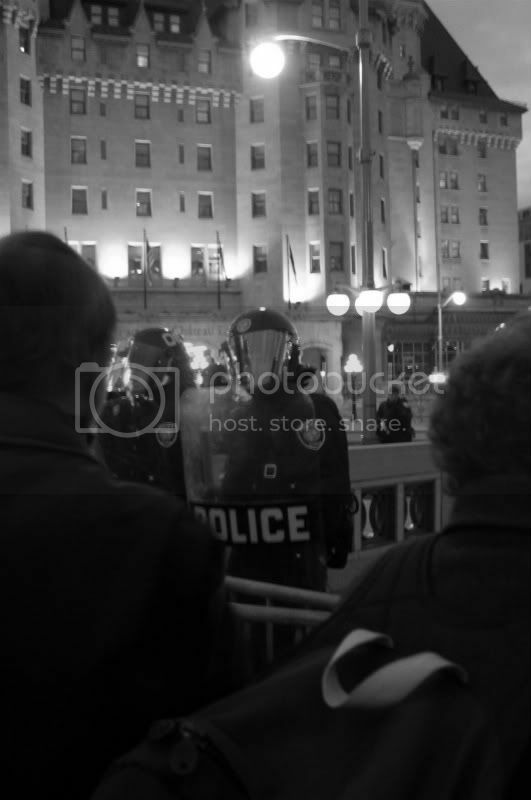 At the 1997 APEC Summit the RCMP was accused of using excessive force against the protestors, while during the Stanley Cup riots of June 2011, the Vancouver Police came under criticism for not doing enough to stop the rioters.